Imagine a red carpet leading to a waterfront South Florida estate where refreshments are served as deep-pocketed investors mingle, ready to raise their paddles in a heated competition to spend millions of dollars for a mansion. That is an increasingly frequent scene playing out on local shores. Auctions of luxury homes are growing in popularity, as sellers opt for the certainty of a fixed sale date that comes with putting a home on the block. It also allows them to tap into an auction house’s database chock full of wealthy buyers worldwide, and limits expensive carrying costs on high-priced properties that can otherwise take years to sell. Amid an overall sluggish sales market, auction companies say business is booming this year, with an increasing number of luxury listings either referred by sellers or by brokers who can use them as a sales tool, earning commissions on the deal. Auction company CEOs and real estate agents say the advantages to the seller go well beyond a quick closing. An auction can boost marketing muscle and create competition for a property. The sales are also considered “clean” — free of contingencies and financing — and come with six-figure deposits, which means a likely closing. “This is the way the wealthy and uberweathy have chosen to buy real estate in the 21st century,” said Marc Hameroff of Engel & Völkers Miami. He is co-listing a $68 million waterfront estate at 41 Arvida Parkway in Coral Gables with Lourdes Alatriste. The home is set for an online auction by Concierge Auctions from March 19 to 22. The growing popularity of auctions is evidenced in how Concierge’s business has ramped up in Florida. The number of sellers the firm spoke to rose from 102 in 2016 to 292 in 2017 and 522 in 2018, Concierge founder and President Laura Brady said. The company auctioned six properties in Florida in 2018 and is on target to hold 16 auctions statewide this year, which would top its record of 12 auctions in 2009. “Florida is one of the leading markets for us in the $20 million-plus category,” Brady said. Naples-based Elite Auctions has also seen its volume of properties grow, up 125 percent from 2017 to 2018 and up more than 150 percent so far this year, said Randy Haddaway, founder and CEO. He is also seeing an increase this year in sellers calling directly, to 75 percent from 65 percent. A wider audience of potential buyers is just one of the reasons why luxury homeowners are going the auction route. Other reasons? The sheer size of the inventory of luxury properties, and the length of time they can linger on the market. 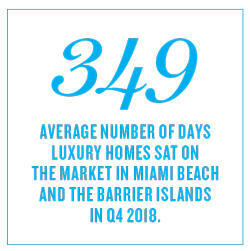 In the fourth quarter of 2018, 183 single-family homes of $5.9 million or more were on the market in Miami Beach and the barrier islands, according to Douglas Elliman. The eight top-tier homes that closed in that period took an average of 349 days to sell — or almost a year. At that pace of sales, it would take 68.6 months to sell all the inventory — or almost six years, according to the Elliman report. “It’s a buyer’s market, and sellers are going to have to look to other ways to create excitement and interest in their properties,” Gall said. Once a property has lingered on the market for several months or years, it’s considered stale. 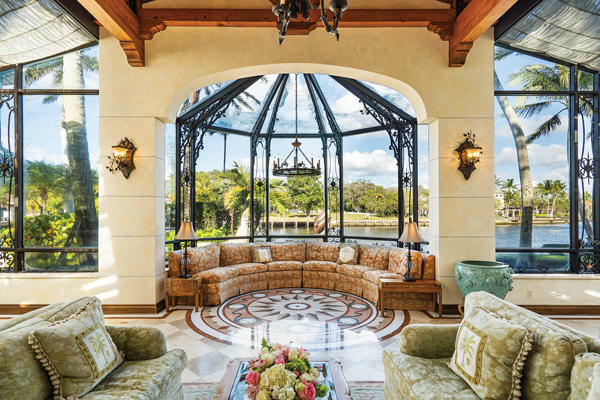 “There’s no greater challenge a property faces than the stigma of sitting there too long and not being sold,” said Trayor Lesnock, founder and president of Miami-based Platinum Luxury Auctions. Meanwhile, taxes, insurance, landscaping and other maintenance costs can add up, along with mortgage payments, if there are any. “Frustration is a big motivator — frustration that the traditional brokerage process has not given them any results,” Lesnock said. Kristina Gustafson used Platinum to auction her Wellington farm in 2017. “The key is you get more buyers to the table and you get a definitive closing date,” said Gustafson, who was a Realtor at the time with Southfields Real Estate. In South Florida, auctions are held live onsite at a property with registered bidders in person or either by phone or online. Concierge handles most of its auctions online, which has led to lawsuits alleging that the company used fake bidders to increase the price of homes or to make sellers think there was more interest in their properties than there really was, according to a Wall Street Journal report. Concierge has denied all the allegations. Brady said online auctions offer privacy, transparency and the convenience of being able to bid from anywhere in the world. “Anyone can log onto the site and see the bidding of all auctions open and see bids and bid numbers,” she said. The bidders are anonymous. Auctions can also have disadvantages, including the possibility of getting a lower sale price than the seller was hoping for. And if a buyer emerges who wants to lock in and buy the property before the auction date, the seller may cancel, but may be responsible for marketing costs that could be in the hundreds of thousands of dollars. In the world of auctions, properties can be sold with a reserve — a minimum bid — or without a reserve, which is referred to as an absolute auction. Elmes recently had the listing and brought the buyer for a waterfront home in Fort Lauderdale Beach that sold for $8.1 million at an auction held by DeCaro Auctions International. There were 21 registered bidders, and Reno, Nevada-based real estate magnate Don Norman had the top bid for the mansion, which had been listed for nearly $13 million. “I didn’t recommend the auction for this house,” Elmes said. “I think we could have sold it for more if had been priced correctly.” Yet the seller was happy with the outcome, he said. The entire auction process, from listing to closing, can be completed in less than 90 days. Auction companies generally take about six weeks to market a property before holding the auction, and the buyer generally closes about a month after. Before an auction is held, buyers are required to put down a bidder registration fee of $100,000 to as much as $250,000. Then the winner must put down more after the auction, to reach 10 percent of the sale price. Buyers also usually have to pay a buyer’s premium of 10 percent, which covers the commissions. Gall said he started the practice for real estate auctions 35 years ago, borrowing the idea from Sotheby’s and Christie’s, which use it in their fine art auctions. The commission split varies with the deal, said auction experts. “When a Realtor brings us a deal, we come up with a split advantageous to the listing Realtor because they are under pressure from the seller,” Gall said. In recent years, auction companies have seen more homes that are listed for $20 million or more, with one recent sale breaking an auction record. 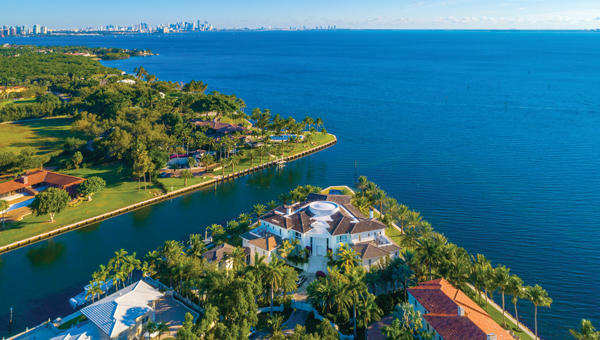 Concierge, along with listing broker Ralph Arias of One Sotheby’s International Realty, handled the sale of “Le Palais Royale,” a 60,000-square-foot waterfront estate in Hillsboro Beach late last year that marked the highest price ever achieved for an auction in the U.S., Brady said. Eleven potential buyers bid for the property — above an average of eight bidders, she said. In the end, records show, Teavana co-founder Andrew Mack paid $42.5 million for the estate, a massive discount from the original $159 million asking price in 2015. Billy Nash, founder of Nash Luxury Real Estate at the Keyes Company, said he is “a big believer in the process” of auctioning a home. As the listing agent, he suggested that the Fort Lauderdale waterfront mansion of the late H. Wayne Huizenga go up for auction. It hit the market last year, asking $27 million. Concierge has set the auction for March 26, with no minimum bid. “To get the global attention that trophy properties deserve, having an auction and creating a finite time frame to bring buyers to the table to me adds tremendous value,” Nash said. But the luxury home auction that really started it all, according to Fisher, took place in 2013 and involved the future president. It was the onsite auction of the Versace mansion in Miami Beach. The Nakash family ultimately paid $41.5 million for the estate but the backup bidder was Donald Trump, said Fisher, whose company held the auction. “He told me, stop at $37 [million] and he stopped at $41 [million],” Fisher said. Eric Trump was onsite, but Fisher said he dealt directly with Donald Trump. Fisher is now set to auction embattled developer Robert Matthews’ Palm Beach mansion at 101 Casa Bendita on March 28, by order of a U.S. bankruptcy court. Previously listed for $44 million, it has a $31 million reserve. Federal officials have charged Matthews, the former developer of the Palm House Hotel in Palm Beach, with multiple counts of wire fraud, bank fraud and money laundering over the unfinished development. Amid the ongoing slow luxury sales market, Fisher expects auctions to keep thriving. He is now in negotiations with several sellers of condos in Sunny Isles Beach and South Beach and is hoping to have those auctions on the books soon. Fisher sees it as a trend emerging. “The next wave is going to be the luxury condo, penthouse market,” he said.